Dell has launched a new range of Alienware gaming PCs which come with the Ubuntu Linux OS installed as standard. The Ubuntu powered Alienware X51 small form factor (SFF) PCs are currently a US exclusive proposition. The range spans configurations starting from a base of an Intel Core i3-3220 with a 1GB GDDR5 NVIDIA GeForce GTX 645 at $599, to an Intel Core i7-3770 3.4GHz Quad Core paired with a 1.5GB Nvidia GeForce GTX 660 at $1049. The entry level price is $100 less than the same configuration sporting Windows 7, however due to a promotional discount offer, the top spec Ubuntu model is the same price as the equivalent Windows 7 version yet has a smaller HDD (1TB instead of 2TB). Various reports speculate whether Dell is aiming for “Steam Box” status with its Alienware X51 offerings. As mentioned above, the Alienware X51 if a SFF PC, it’s quite living room friendly in appearance, like a black console. The X51 is designed for either compact tower orientation or to lie flat. The colour of the PC is described as “Matte Stealth Black with Dark Chrome Accents” and the dimensions are H: 343mm tapering to 318mm, D: 318mm, W: 95mm. The weight of the PC is a pretty hefty 5.5Kg. The system also comes with quite a big power brick. 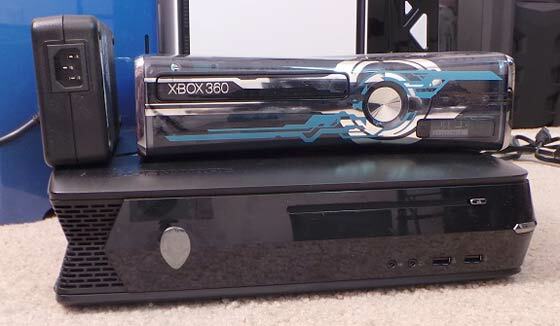 Xbox 360 slim on top of an Alienware X51, also showing the X51 power brick. 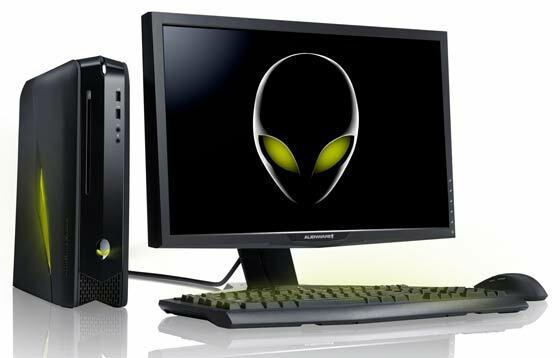 Dell is heralding the new Alienware X51 line as “the ultimate gaming hardware” for the open-source Linux OS. However, even though Alienware PCs are gaming focused, the company doesn’t want to present the Alienware Ubuntu PCs are one-trick devices. There are sections on the new Ubuntu X51 information pages describing Ubuntu as “Simple and stylish”, describing it as easy to use and working with the same media files you enjoy on your current PC. Also highlighted are the security of the OS and the free applications available; everything you might need for office productivity, music, video, chat, browsing and so on. Turning to gaming software, the features and description leans heavily on Steam’s Big Picture Mode “With over 25 gaming titles available and more being added, users can access Steam For Linux to play online games, including your favourite titles like Team Fortress 2 and Serious Sam 3” trumpets Dell. However the Dell copy writers have undersold it there, as the Steam Store lists 168 games as being available for Linux, this is significantly “over 25”, some would promotionally exaggerate this amount by calling it “almost 200”. For comparison there are 1,941 Windows games available on Steam today. I would like to see more Linux laptops, for desktops it isn't a problem because it is so easy to build your own. Can't build your own laptop easily so I would imagine Linux on laptops would be a better bet. It is interesting to see Ubuntu being promoted as a gaming operating system, be interesting to see if the focus on gaming could finally get Linux into the mainstream desktop space.